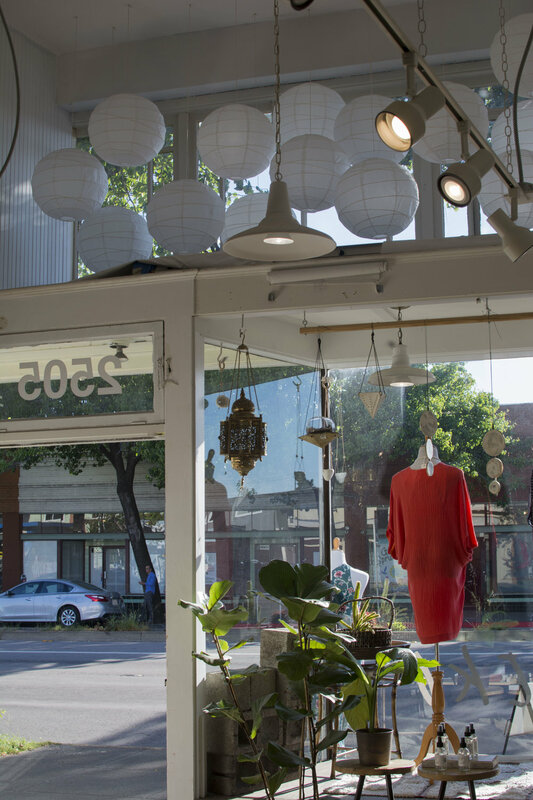 Tucked away on a cute little block of San Pablo Avenue in Berkeley lies a small, cozy shop full of natural sunlight. Upon walking into the store, I didn't see Ash, the store owner, and wondered if she might be in the back room. However, seconds later, she runs into the store with a few bottles of beer in hand. "I'm from the Midwest", she later explains, "it's only proper to offer your guests a beer". She then somehow manages to open the bottles with my very cute but almost entirely useless Texas shaped bottle opened I picked up at a Buc-ees last summer. I can quickly tell that we're going to get along. Ash's store, Neeko, is a calm space with wood floors, white walls, and lots of greenery all around. In a word, it is very Berkeley in the best possible way. 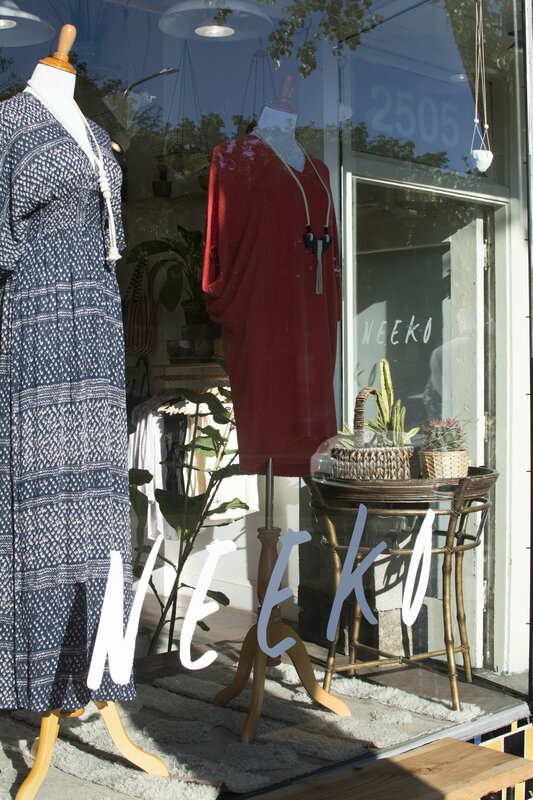 After sipping our beers for a bit, she tells me about her vision for the store, why she "blames it on Berkeley", and where the name Neeko came from. A lovely smiling Ash stands at the front of the store. When did you open the store and what made you realize it was time to do so? "I opened the store a little over a year ago. I was very fortunate to always have known what I wanted to do. I remember being little and setting up my bedroom like a store and making my family shop in it. Then I went to college to study fashion, but dropped out pretty fast. I was I’m from Indiana, so studying fashion there seemed weird. So I went right into managing stores at 18. And now, a little over ten years later, here I am!" You're from Indiana and now you're in Berkeley, so where all have you lived? "I definitely lived up my 20s. I made it worth it! I'm originally from Indianapolis. I moved to Savannah, Georgia nextbecause a bunch of my friends went to the art school there, so I jumped in their Uhaul and started working. Next, I moved to Austin, and I lived there a couple years managing stores. That’s where I met my first mentor, and I managed her store that was a lot like this. Then I got a job in San Francisco, which brought me here." How do you find different brands to carry? "That’s the fun part! Luckily working in the industry for so long, I already had relationships with brands. Now it’s Instagram! I find all my small up and coming brands from Instagram or Pinterest. Also from word of mouth or events like West Coast Craft and Renegade." 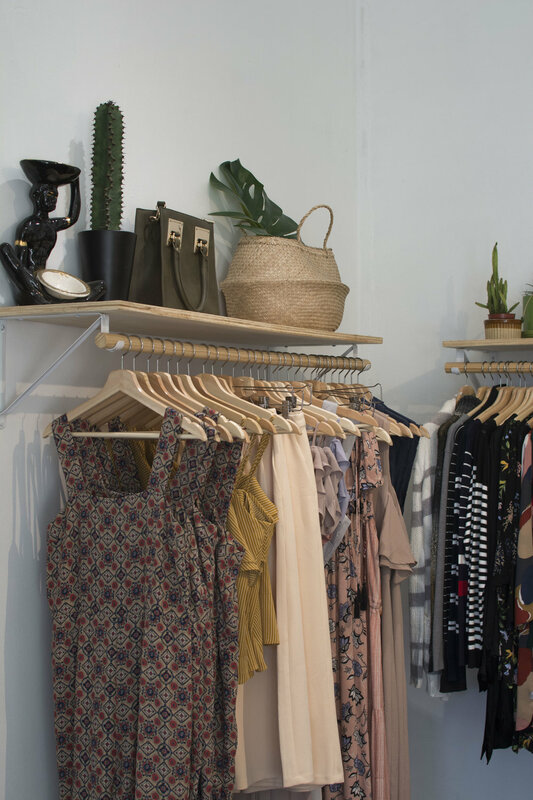 There's definitely a lot of different styles represented in the store, but what was your aesthetic vision when you opened? "I’m trying to provide a place where women and come and leave feeling confident and beautiful and not intimidated by shopping at a boutique. My clothes are easy to wear. My price point is pretty reasonable. I’d say more than half my stuff is under $100, so people can make a special purchase without feeling guilty." Big windows at the front of the store bring in lots of beautiful natural light. Is there anything about Berkeley and this area in particular that influences the style of the store? "So I have a hashtag on my personal Instagram that I called 'Blame it on Berkeley'. Linen sack dresses? I blame it on Berkeley. If you would’ve come in here the day the store opened, it was very Austin - Southwestern and Bohemian. I realized within the first month that is not exactly my core customer, so I changed the game and evolved to where NEEKO is now." Ash also carries beauty and home items, as well as cards and coffee! Where did the name Neeko come from? "So my name is Ashley. I went to school with a lot of Ashley’s and never really liked having a common name. Later in life, I was working with this woman who called me Neeko. It just stuck with me. I wanted to create a space here where women can come and create their own identity. If you see something and think 'oh I can’t pull that off' just think 'well, Neeko can' "
Ash also carries lots of great jewelry by small designers. She focuses on jewelry with fibers and other mixed materials. What’s your favorite and least favorite thing about running your own business? "My favorite thing is, well I have two things. I love clothing. I love the art of appearance. If you feel down, go put on a beautiful dress, do your hair and makeup, and you automatically feel better. Number two is my customers! They’re so cool. The hardest part is that I literally eat, breathe, and sleep the shop all day. It’s just everything that comes with it. But if that’s my biggest complaint, then that’s ok."
What are you most excited about in the store? "I think I’m most excited about these hemp tee shirts! (They're by the brand Backbeat Rags, and you can shop them out online here, here, here, here, AND here). Hemp lasts longer than cotton and the cut is really cool. Also, this year I’m focusing on quite a few collabs. I have one with a local artist Liz Hernandez who hand paints linen dresses with clay." Just a few racks with various tee shirts from Backbeat rags in mustard yellow, white, and olive green colors. Thanks so much to Ash for letting me stop by the store! She was incredibly sweet and welcoming. After trying on a few items (and buying a few of those super soft hemp tee shirts), I can definitely say that she's achieved her goal of creating a safe and relaxing space for women to feel beautiful. The dressing room is such a calm and serene space (the lighting wasn't conducive to photos, but definitely go check it out yourself! ), and Ash gives great styling suggestions for all her items. 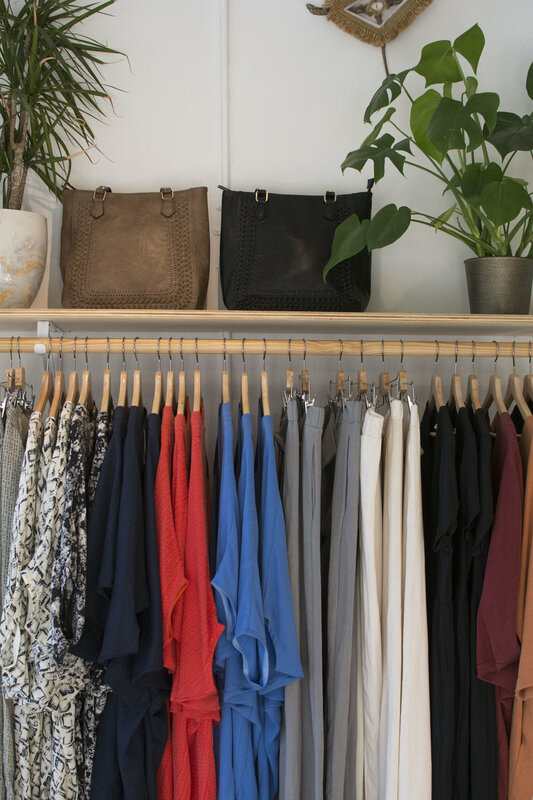 If you're in the Bay Area, stop by at 2505 San Pablo Avenue (Berkeley 94702). Tell her I sent you! You can also shop online at shopneeko.com , like the Facebook, and follow the Instagram. Plus, like my Facebook for updates on new posts! Thanks for reading.